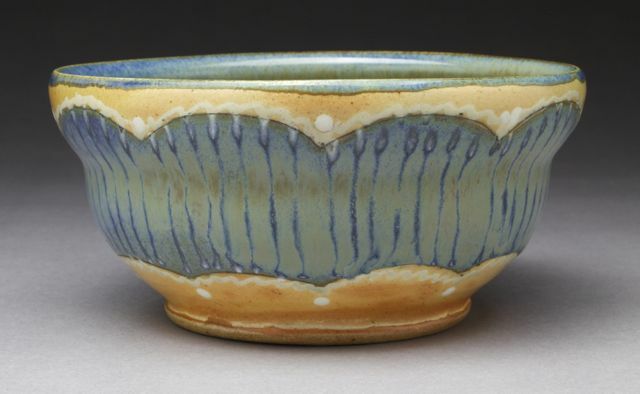 My work is soda fired stoneware with slip, glaze, & brushwork finishes. I use light stoneware that leaves the exposed clay a lightly toasted look after firing. The soda firing gives me oranges to medium browns on my surfaces that enhance my brushwork & also gives depth to colored glazes. I enjoy the thought that pottery is an art that people can use, drink & eat from. This reason alone is why I choose to do what I do. I find the interaction with pottery on a utilitarian bases a precious oddity in the art world today & gives me great pleasure to know that people are interacting with a part of me that is transferred into my work. My inspirations are rooted deeply in nature. The multitude of shapes, colors, & the beauty of the imperfections within it overwhelm me. My hope is to bring honor to the Earth & hope people will connect with nature or at least be reminded of it through my work. My work is NOW AVAILABLE ON ETSY!